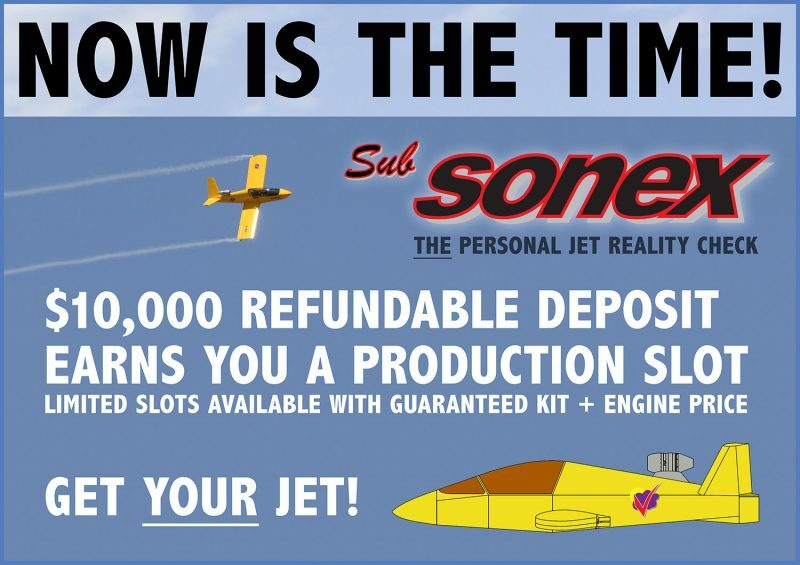 Sonex Aircraft, LLC announced today that Kit Reservation Deposits are now being accepted for the SubSonex Personal Jet. A $10,000 refundable deposit will allow SubSonex customers to receive position numbers for the first kit deliveries, anticipated to commence mid-year, 2014. Sonex also announced that an introductory price of $125,000 will be guaranteed for the first ten Kit Reservation Deposit holders, which includes the SubSonex Ultra-Quick Build Kit and the PBS TJ-100 turbojet engine with installation accessories. The announcement came at a briefing for prospective SubSonex customers and members of the media as part of the company’s 10th annual Sonex Aircraft Open House and Homecoming Fly-In, an event held at Sonex factory headquarters on Wittman Regional Airport in Oshkosh, that kicks-off the week’s events at EAA AirVenture Oshkosh 2013. The SubSonex Ultra-Quick Build Kit is intended for flight under Experimental Exhibition category rules. Without the “51 percent rule” restrictions associated with Experimental/Amateur-Built airworthiness certification, the SubSonex will ship with a pre-assembled fuselage, wings, tail and control surfaces with canopy and windshield installed. The SubSonex customer will install the easily removable outboard wing panels, engine and fuel system, bolt-in the retractable landing gear, install avionics, electrical systems and controls, install the supplied BRS full-aircraft recovery parachute system, pre-molded fiberglass components and upholstery, and add paint. Under Experimental Exhibition category regulations, SubSonex customers will also have the freedom to take advantage of builder assist centers or aircraft finishing services to do the work for them. Working commercial pilots operating jet or turboprop aircraft can easily qualify for the FAA Letter of Authorization (LOA) required to fly the Subsonex, and small aircraft currency can be provided, if needed, via Sonex Aircraft’s T-Flight Transition Training Program. Pilots without previous jet experience can also qualify after obtaining the appropriate training, and all prospective SubSonex customers are invited to contact Sonex Aircraft representatives to discuss their flight qualifications. The TJ-100 turbojet engine is produced by PBS Velká Bíteš of the Czech Republic, a large manufacturer of rotary machines with roots dating-back to 1814. The TJ-100 is designed for UAV, UCAV, experimental aircraft and motorized gliders with hundreds of units delivered since its introduction in 2008. The engine is a true “plug & play” package featuring integral ECU, starter/generator and oil system, and ships complete in the SubSonex kit with instrumentation, throttle control, pre-wired harnesses and other installation components. The 247 lb thrust engine continues to exceed the expectations of PBS designers and customers alike, with flawless performance and an outstanding service history, all backed by top-notch customer service. The TJ-100 can fit in a small crate to be economically shipped for service, and PBS can turn-around inspection and overhaul service orders in a single week. The in-progress JSX-2 prototypes were on-display at today’s customer and press briefing, along with the original JSX-1 proof-of-concept prototype, and a JSX-2 cockpit mockup for prospective customers to try-on. The JSX-1 prototype and the JSX-2 cockpit mockup will be on-display at Sonex Aircraft’s AirVenture exhibit space in the North Aircraft Display Area, booth number 622, throughout the week of AirVenture. The in-progress JSX-2 prototypes will be on-display in Sonex Aircraft’s Hornets’ Nest Research and Development Center, available for viewing during factory tours being held each morning of the show. The JSX-1 prototype will once again be featured in flight demonstrations during the showcase presentation at AirVenture. Tentatively scheduled for Tuesday and Thursday during the afternoon air show, the SubSonex will be flown by lead test pilot and Super Salto Jet Sailplane air show performer Bob Carlton. Bob Carlton and John Monnett will also be appearing with the SubSonex to speak about the aircraft and its flying qualities on AirVenture’s Phillips 66 Plaza main stage from Noon to 1pm on Thursday, August 1st.